A tiny white dot over two miles away. That’s all my 75x spotting scope could make out. That’s it. Three thousand miles from Fayetteville and now six days had passed lugging a 70-pound pack on my back and I had hardly seen a sheep. I was anxious. I’m a whitetail hunter at heart. Treestands, crisp fall mornings, and manageable broadside shots with the 30 pin are my thing. Over the past few years I started to dabble in hunting out West. I’m cautiously confident in my ability as a hunter, but I’m still humbled. 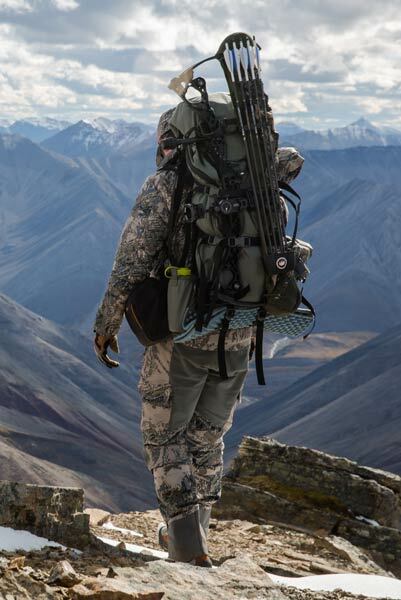 A backcountry Dall sheep hunt had always been at the top of my bucket list. There’s just so much unknown. Maybe two out of 10 hunters could pick out a Dall ram in an encyclopedia. That is to say very few people in world’s history have ever seen one in the flesh. They’re majestic animals that hang in some of the gnarliest terrain in North America. To get close to one is the ultimate challenge as a hunter. Just getting to camp is a whole other challenge. Fayetteville to Chicago to Edmonton, a night at the Fairfield Inn, fresh Tim Horton’s and then from Edmonton to Yellowknife to Norman Wells, another night in a decent hotel, wake up and then hop on a Twin Otter prop plane to the Mackenzie Mountain range to Arctic Red’s camp. We’ve now downgraded from Tim Horton’s to a Keurig and the next morning we leave the airstrip in a Piper Super Cub with 160 horsepower taking us as deep into the backcountry. If you’re keeping score that’s three days of travel. Now, on day four, we hiked from 8am to 9pm. It sucked. What sucked more was then getting stuck in our tents for two and a half days because of rain. I should have brought a better book. At this point we had only seen one sheep a few miles away and it might as well had been an Ikea faux rug because I couldn’t tell the difference. But this how sheep hunting is supposed to go, right? On day seven the clouds lifted and we were on the move. Kevin, our guide that I swear had been raised by mountain goats, lead us to a natural mineral lick historically known to have sheep this time of year. Sure enough, on day seven we show up to a mountainside with a few white specks. We throw the glass on them and there he was: the granddaddy, a mature ram—wise, 10 ½ years old, and a shooter. It was too late to try and get into position for a shot so we broke camp and I prayed he’d be there the next morning. While I attempted to recover from the gut punch, Kevin never doubted we’d find him again. That’s what guides are supposed to do, push you when you need to be pushed. A half-day later and we find him on the other side of the ridge, just like Kevin said. We’re still a few miles out, but we get into position within a few hours. It’s day eight of 10 now and we were in position for a somewhat pedestrian stalk with my bow until a young ram appeared out of nowhere and cut the distance between us and the old guy in half. There was no way. Our only route to be able to get close enough with my bow was blocked. If we tried, the younger ram would spook our shooter. Without much hesitation, I switched to my rifle. Would I prefer to have taken him with a bow? Yes. That was the plan. But the plan didn’t work this time and my goal was to kill a ram. So, at 404 yards, I fired off a round and that was it. Now the real work began. It was 6pm when I squeezed the trigger and it was nearly 11pm after we had him cleaned and ready to head back to camp. Once the adrenaline wore off, exhaustion set in. We made it back to camp and collapsed in our tents around 5am. What was one of the most rewarding days of my life was also the most physically and mentally challenging. I was gassed. They say you won't ever taste sheep tenderloins unless you're a hunter or a guide because they don't ever make it out of the mountains. I can confirm that rumor. Back at camp, we roasted sheep steaks over an open fire. Sheep is one of the best wild game I’ve ever tasted. The full body mount of my ram should be delivered from the taxidermist in the next couple weeks. When I look at him I imagine I’ll remember some of the adversity it took to harvest him, but more than anything he’ll make me want to go back. I’ll want to feel the pain of carrying camp on my back, of being the only person in 500 square miles, and the anxiety of not knowing if we’ll even see a sheep. I think I’m okay with being anxious now. Just outside the Arctic Circle and deep in Canada’s Northwest territories, Matt Elder is on the hunt of a lifetime, battling snow, rain, and terrifying terrain to track down Dall sheep in the Mackenzie Mountains.